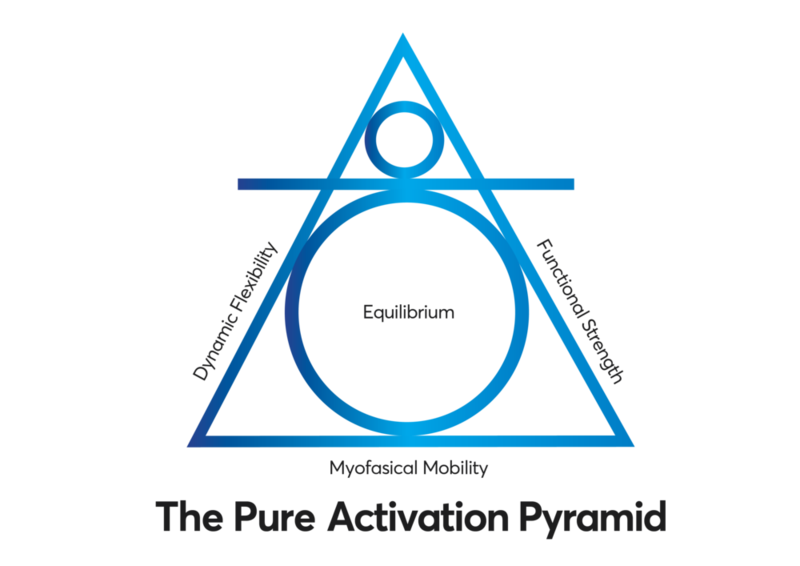 The foundational image of the Pure Activation Pyramid (PAP) is a referral guide that underpins every facet of Pure Activation's training ethos. Grounding this holistic philosophy is the "Key" notion that Connective tissue (fascia), is the most underdeveloped paradigm within most athletes training regimes. Over time we all create tightness and imbalances within our facial chains and slings, this eventually leads to injury and lack of mobility within every human being on our planet. Pure Activation's Myofascial Mobility techniques are a combination of east meets west, and traditional versus scientific, that create the equilibrium we are all looking for within our connective tissue. Functional Strength is a decade worth of personal training experience, that blends weights and fitness tools to harmonise any athletes training regime. While Dynamic Flexability is a yogic inspired formulation, constructed into sports specific movements and flows that add functional range of motion into sports and everyday activities.